I decided not to set an alarm last night. I’ve had a pretty terrible week of sleep due to stuff going down at work, relationship stuff and the mental torture of my lost kit bag – ‘we he see it again, will he not? !’ I figured my body was calling out for a decent rest when I began to feel tired at around 2100hrs – I was asleep by 2145 and I woke at 0910hrs this morning feeling pretty well refreshed. It did, however, mean that I missed parkrun this morning so I was determined that if this was the case I would attempt to complete my ‘Neighbourhood Watch Foot Patrol’ that I tried yesterday! I wrote yesterday that I wanted to link all of the roads in my neighbourhood in one run and that I wanted to do the entire route faster than the attempt I had just made. Well, yesterday I ran 6.1km and missed one small side road and a 150m stretch of road and ran it in 29:00. Today, I completed the circuit hitting the side road and the 150m I missed yesterday which amounted to 7.1km and I did it in 29:04! I must say I’m very surprised as it felt like a much more difficult run today but mainly because I had a stomach full of chips that I’d eaten about an hour before setting off – rookie mistake as I ended up running the last 4km with a cramp in my left side. Still, I obviously subconsciously pushed the pace and kept on keeping on when the going got tough – it’s the essence of hard training when all is said and done! One thing to note, I ran today in my Adidas Adizero Adios Boost as I made the decision after yesterday’s Hoka Clifton run that they are indeed a half size too small. I’m pretty gutted that I’m going to have to put them to the mercy of eBay bidding on the ‘morrow and I hope I get at least what I paid for them as they only have 30 miles in them – they look and feel practically new! In other news, I won my bid on a Garmin Forerunner 610 (with HR strap) – I’m happy to have been able to get an absolutely perfect replacement for my lost/MIA 910xt and for the bargain price of £70. It’s amazing that a tiny scratch can put off so many bidders! 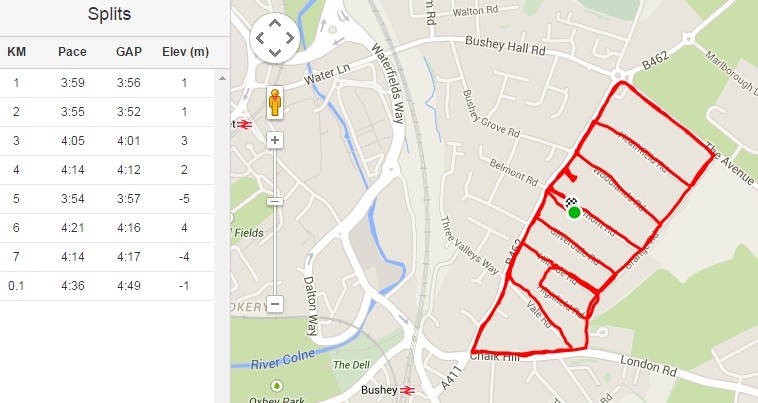 Neighbourhood Watch Foot Patrol – complete route. Criminals and ne’er-do-wells beware! This entry was posted in Post on Mar 14, 2015 by Al Flowers.